This will be the fifth time the Super Eagles of Nigeria will play Argentina in the World Cup. The Super Eagles will play Argentina, Croatia and Iceland in Group D of the 2018 FIFA World Cup in Russia. In the draw that held on Friday, December 4, the Super Eagles seeded in Pot 4 were drawn in Group B.
Argentina were the top seeded team, Croatia were in Pot 2 while Iceland were drawn from Pot 3. The Super Eagles of Nigeria have also faced Argentina four times in five of their FIFA World Cup appearances. Nigeria have lost all of them, a 1-2 loss at the 1994 World Cup, Argentina got a 1-0 win at the 2002 World Cup, Super Eagles lost again 0-1 eight years later in South Africa 2010 and the 3-2 defeat at the 2014 World Cup in Brazil. Nigeria have never faced Croatia and Iceland in the World Cup. 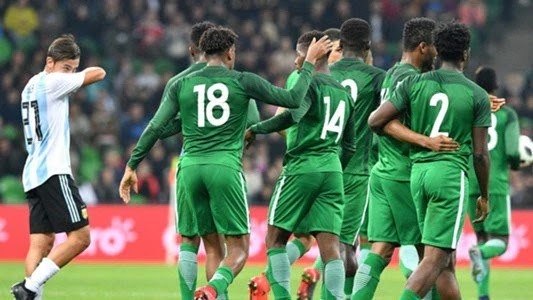 The Super Eagles of Nigeria will kick off their 2018 FIFA World Cup campaign against Croatia on Saturday, June 16, 2018. They play Iceland next on Friday, June 22 before their final group fixture against Argentina on Tuesday, June 26.